Following my US book tour in early 2015 I’m now booked to appear at a load of forthcoming events where I’ll give slide presentations. If you want me to give a talk at your club/society/school/bar mitzvah please get in touch by email. 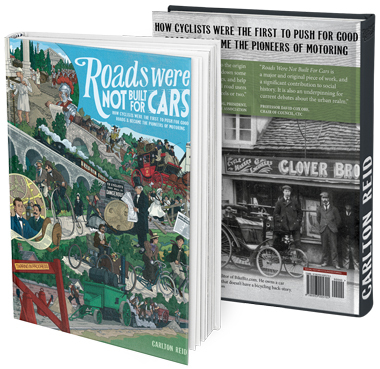 Print copies of Roads Were Not Built For Cars will be available for sale – and signing – at most of the above talks. Alternatively, the book is available from Island Press in the US, Marston Book Services in the UK (see below) or the following book stores. 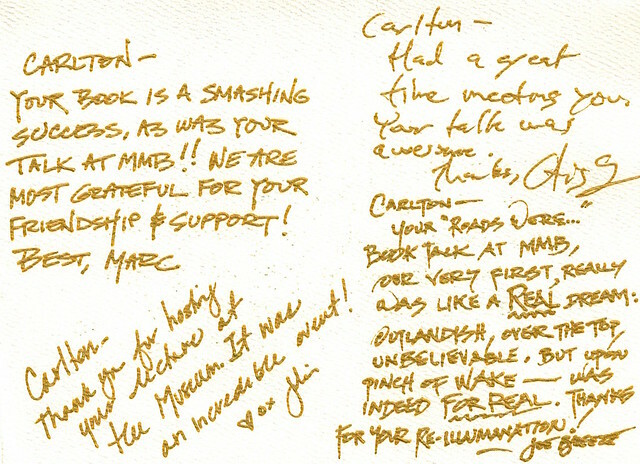 Marc Vendetti, Julia Violich, Otis Guy and Joe Breeze are legends of mountain biking – it was a huge honour to give a talk in their new museum and so lovely to get that thank-you card. You may want to interview mw. I opened Bikecology Bike Shops in Santa Monica CA in 1971 at age 28. I struggled through all of the bike boom problems—shortages, bad quality, poor supplier service, decline of brands (Schwinn, Raleigh, Peugeot), emergence of new ones (Trek, CDale, Specialized), and more. My mail order catalog was a big success and I opened 13 shops over the years. The name changed to Supergo in 1982. Thanks for getting in touch. I’ll email some questions later. Thanks. Carlton. Good luck on the tour! Sounds like a great book. We met years ago, probably at Eurobike or the Taipei show, I use. I’ve been in the bike biz since 1972. Worked retail in Denver, then Durango during my college years. Worked for Trek, Schwinn, Orbea, BH & Pivot. Happy to talk with you. This is very exciting. Can’t wait to get my hands on your book. Let us know if you will be in Massachusetts one of these days. Here in the western part along the Connecticut River from Northampton to Brattleboro Vt we have a very strong bicycling advocacy network — would love to host you at our pub, brewery and restaurant for a talk and book signing. You would do well here. Best of luck on your tours. If you like I would like to speak with you about your next book . I had worked in shops as a teenager during the bike boom in NYC…. I live in London now, but lived in Washington DC for 25 years, 1963-1988. I was on the board of the Washington Area Bicyclist Committee, and chaired its committee that submitted the second longest set of comments that led to the first US semi-decent set of bike facility design standards, by AASHTO. Because Washington was the source of federal money, things tended to converge on there. I’ve met both John Franklin, of Cyclecraft, and John Forester, of Effective Cycling.